ENJOY YOUR VACATION AT THE BEACH! Contact Pat today to schedule your Sunglow beach getaway! We treat strangers like friends and friends like family!! ANY TIME IS A GREAT TIME TO GO TO THE BEACH! UPDATED CONDOS #606 AND #704 WITH THE SAME FLOOR PLAN & AMENITIES AT SUNGLOW RESORT IN DAYTONA BEACH SHORES. CHECK OUR ONLINE CALENDAR AND ONLINE REVIEWS TO MAKE YOUR PLANS TO GET AWAY. GRANITE COUNTERTOPS IN UPDATED CUSTOM KITCHENS! FRIENDLY OWNERS! LIFE IS BETTER AT THE BEACH! MAKE YOUR PLANS EARLY WITH PAT FOR A WONDERFUL BEACH VACATION! We offer you two one-bedroom condos #606 and #704 (with the same floor plan & amenities) located on the sixth and seventh floors of the SUNGLOW RESORT in Daytona Beach Shores @3647 South Atlantic Avenue (5.5 miles south of the Main Street Pier). This Resort is situated on the beach in Daytona Beach Shores, adjacent to the Famous Sunglow Pier, home of Crabby Joe's casual restaurant! UPDATED KITCHENS WITH SNACK BAR, GRANITE COUNTERTOPS AND TABLES. 42' LED HD TVs and Blu Ray DVD players with 32' HD SMART TVs in the bedrooms. The condos are true one bedroom oceanview apartments, not converted hotel rooms or studios. WONDERFUL views of the Atlantic, Sunglow Pier, the beach and surfers from the living room, kitchen, and private balcony! FREE secure wireless high speed internet service. Friendly front desk staff to assist you during your stay. The queen sleeper sofa is comfortable for two children or one adult. All tile floors. These are NO SMOKING and NO PET condos. Each beautifully decorated condo is available for your pleasure and comfort with fabulous views of the Atlantic Ocean and Halifax River from your private oceanview balcony. Enjoy walking on the beach, sand castle building, relaxing in the pool and jacuzzi, surfing, Lighthouse Museum, or cruise on the casino boat! Eat at the many fine and casual restaurants or use the fully-equipped kitchen. Public transportation is available at Sunglow's doorstep. Pets are not allowed (Association rules). These are NO Smoking and NO Pet units. Flights are available into the Daytona Beach International Airport, Orlando International Airport, and Orlando Sanford Airport. Enjoy the fun activities at the Daytona Boardwalk and Daytona Lagoon water park, just five miles from Sunglow. We also own 2 Two Bedroom/Two Bath Deluxe Direct Oceanfront Condo in same building now available at discounted rates!! See Pat's Place VRBO listing #34605 for rates and availability. Only one hour from Major Attractions Including Disney World, Sea World, MGM Studios, Kennedy Space Center Tours, Historic St. Augustine, and Great Outlet Malls in Orlando and St. Augustine. 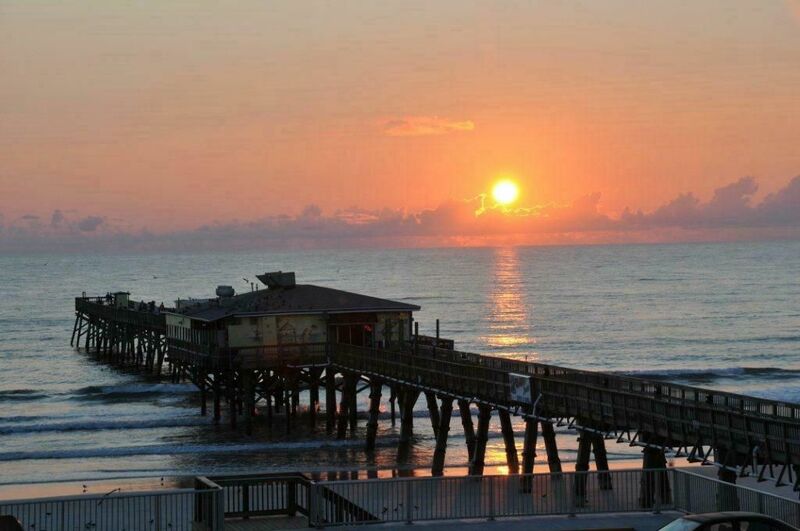 It is also close to Nascar Racing, Restaurants, Great Birding, Deep Sea and Pier Fishing, Adventure Water Park, Daytona Beach Airport and Much Much More! Daytona is the World's Most Famous Beach! Lots to see and do. Join the fun! Eating at the nearby Ponce Inlet Restaurants and Crabby Joe's on the Pier next door, Ponce Inlet Lighthouse, Marine Science Center nearby. Five miles to Bubba Gumps and Joe's Crab Shack restaurants. Wonderful walks on the Beach. Watching the surfers. Entertainment area at the Main Street Pier, five miles north of Sunglow. Sunglow is on the beach. Wonderful SE view of the Atlantic Ocean and Halifax River from the condo private balcony. Watch the surfers and wonderful sunrises! Wonderful SE view of the Atlantic Ocean from the condo balcony. Sunglow Resort is on the beach. Watch the surfers and cars driving on the beach. Sunglow Resort is on the beach with oceanfront pool and hot tub. Deck and grills. Great location 5.5 miles south of the Main Street Pier & Boardwalk. Central Air Conditioning -- gotta have that in Florida! Central heat -- seldom needed in Florida! Off street parking next to building. Secure building WiFi internet provided by Spectrum cable. Six sets of bath towels. Please bring your beach towels. Free secure building wireless high speed internet access provided by Spectrumcable. Charter fishing available in nearby Ponce Inlet. Jet Skiing and Para-sailing in the summer. Golf courses are located nearby. Resort Swimming Pool overlooking the beach. Heated in Winter. Comfortable chair and Queen Sleeper Sofa in living room, 2 Phones with answering machine, Central Air Conditioning, 42' flat screen TV with Blu Ray DVD, 2nd TV with DVD in bedroom, Tropical furniture & Plantation Shutters in the bedroom, Fully equipped Kitchen with Snack Bar, Stove with Oven, Updated bath with tile & grab bar & ADA toilet, Refrigerator with Ice Maker, Washer & Dryer on premises, Pets not allowed per building policy. We are so glad to hear Josiann enjoyed her stay. We will welcome her back and hope she returns to stay with us again! A cozy and clean one-bedroom apartment with a side balcony overlooking Sunglow Pier and beautiful vistas of the Atlantic. You can watch the sun rise everyday while having your morning coffee. The owner is very friendly and accommodating, calling to check in a couple of times during my stay. The unit is equipped with much of what you need, even for an extended stay, cooking, watching TV, one in the living room and another in the bedroom, and a very comfortable queen size bed. A public and strong internet connection and signal are available free of charge. Parking was never a problem, though I do not know if it is as good in high season. The building is kept clean by Dennis who is very pleasant and helpful. The front desk is staffed by friendly and welcoming ladies. All in all, I had no complaints, would recommend the condo, and hope to use it again in future visits. We booked 704 at the last minute due to changing our fall break plans due to Hurricane Michael. Pat was very accommodating to our needs. The condo was very clean and well equipped for our family. We loved the view of the ocean and the river not to mention watching the people on the pier provided entertainment. We will definitely come back soon! Thank you! We were glad to assist Jennifer with her last minute booking and we will welcome her back to stay with us again. If she needs a larger Sunglow condo next time, our two bedroom/two bath condos will meet that need. Great little condo. Clean and updated. Had a great time! Weather was excellent. We’re glad Sandy enjoyed her stay in our Sunglow condo. Our location is great in Daytona Beach Shores. We hope she will return to stay with us again some time in the future. Thanks, Sandy! Pat's place was a great place to stay for my daughters 16th birthday. Steps to the beach and pool, local shops close by and the condo was very clean and just the right size! We’re glad to hear our guest’s 16th birthday was celebrated at the beach. We hope they return for #17! Marine Science Center and Lighthouse nearby, Sand Castle Building, NASCAR Racing, Boat Rentals, Dog Racing, Casino Boat, Waterside Tiki Bars, Deep Sea Fishing, Pier Fishing, Steel Bands, Birding, One of Florida's largest Flea Markets. Water Park and Boardwalk & Main Street Pier five miles. Great restaurants.